Nirvana's second album — the immeasurably influential and multi-million selling Nevermind — somehow turns 20 tomorrow. 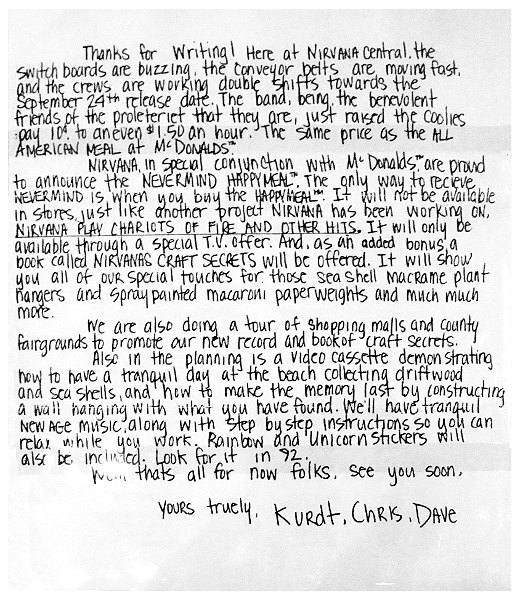 The band sent out the following handwritten letter to a number of fans during the run-up to its release on September 24th of 1991, and jokingly referred to, amongst other things, a tie-in with McDonald's whereby copies of the forthcoming album would be bundled in with Happy Meals. Thankfully it remained fictional. Transcript follows. Image kindly supplied by by Corey Massey. Thanks for writing! Here at NIRVANA Central, the switch boards are buzzing, the conveyor belts are moving fast, and the crews are working double shifts towards the Septemeber 24th release date. The band, being the benevolent friends of the proleteriet that they are, just raised the coolies pay 10¢ to an even $1.50 an hour. The same price as the ALL AMERICAN MEAL at McDONALDS™. Also in the planning is a video cassette demonstrating how to have a tranquil day at the beach collecting driftwood and sea shells, and how to make the memory last by constructing a wall hanging with what you have found. We'll have tranquil New Age music, along with step by step instructions so you can relax while you work. Rainbow and unicorn stickers will also be included. Look for it in 92.